There has been a great discussion in the comment section of the latest TNT episode where Tripp talks with LeRon Shults and Barry Taylor, both of whom I admire. Shults defends a form of radical theology and at one point even uses the term “atheist” to describe himself. His ontology is a strictly “naturalistic” one. It reminds me of Kester Brewin’s recent criticism of Rob Bell’s benevolent conception of the universe. Several people commenting in response to the conversation have asked why process philosophy or theology isn’t more attractive to Shults, or why it doesn’t pass the science test. This is a great question and a discussion worth having, but I want to make another observation. When it comes to the place of the Bible in the 21st Century North American cultural landscape, one problem is obvious: Conventional Evangelical beliefs about it do not seem to stand up to intellectual scrutiny. Many Mainline Protestants, on the other hand, have long been accused of conceding too much of the Bible’s authority to its scholarly critics. With Christendom in the past and the promises of modernity now arguably in shambles, whether and how people of faith can restore sustainable confidence in their sacred scripture for the future remains a critical and mostly unanswered question. In response, I propose that one promising path forward may be found in the post-critical biblical hermeneutics of the 20th Century Catholic theologian Hans Urs von Balthasar. In von Balthasar’s “theodramatic” imagination, the Christian life is likened to the theater. History is a performance on the world stage. God is the author, the Holy Spirit the director, and Christ the lead actor. Human beings too have an important supportive role to play, as they are called to participate in God’s mission of redemption – to “dramatize,” as it were, God’s will on earth as it is heaven. As has been suggested by others, I think the Bible should be read and seen as drama as well. In literary terms, the Bible is indeed a great narrative, and like any story, there are key moments that set the tone and determine the way that future events will unfold. The analogy isn’t perfect, but in this light, it can be argued that, while no less inspired or authoritative, the Bible and its interpretation can begin to function in a more dynamic, subtle and compelling way. And when this happens – remarkably! – whether one problematic verse or passage appears to conflict with the character of God as revealed in Christ no longer has the power to undermine the credibility of the entire biblical canon. One of the main reasons for this is that, viewed as drama, the Bible takes on a shape and an organizing form rather than just a status (inerrant, infallible, etc). Hence, instead of predominately being read as a collection of propositional truth statements or moral guidelines, the structure of the Bible itself and the big story it tells becomes an enriching tapestry into which people get to be woven for the purpose of creating something beautiful and transformative. The problem though is that, without a key or high point to help us discern its overarching pattern, the otherwise revelatory, admonishing and redemptive texts of the Bible can become blurred and confused with the tragic, comic and obscure elements that are also strung throughout. This is why the climax of a drama is so crucial for distilling its most fundamental meaning. Of course the climax is not all that matters. In fact, the other parts are essential for forming the whole, but the heart and the rhythm that tells us the story’s central significance is utterly lost without its culminating moment. The climax of a drama, therefore, is like the axis of a wheel out of which the supporting characters and events shoot like spokes in every direction. The climax is the key event that captures all others and reorients them into its orbit. In the case of the Bible’s drama in particular, the climax occurs in the event of God’s self-revelation and dramatic action in the incarnation, life, death and resurrection of Jesus Christ. Moreover, this claim is also what distinguishes the Christian understanding of revelation from that of most other religions, but especially Judaism and Islam. God is shown, and God’s love is demonstrated, by dwelling fully in a human being (Colossians 1), and not first and foremost in a sacred text or law. But how will we know this form when we see it? How do we avoid arbitrarily relying on our own reason and experience when interpreting Scripture? Reason and experience are crucial, but they can’t be the highest measure of our faith. Something else has to function as a hermeneutical key. As already indicated, and as Balthasar has answered for us, the key is the climax of the drama itself: the person and teachings of Jesus, the one who fulfilled the letter of the written law by going beyond it in divine and human form. In other words, because there are human and cultural fingerprints all over the Bible, there has to be a climactic light that illuminates each passage to show us the difference between its human and divine components. Karl Barth was another giant figure who stressed that the Bible must become the Word of God, which occurs when it is read and exposited by a faithful, worshiping community. Revelation is an event. It never belongs to an object or text as such. It approaches us more so than the reverse. This would partly help to explain why people are able to use and abuse the Bible for all kinds of distorted ends. Thus – and this is what has been so difficult for modern people – interpreting the Bible is not just an intellectual activity. It is the activity of the eyes, ears and heart in the light of faith, guided by the Holy Spirit and the key of the Incarnate Word. In this way, the church can learn to see and discern its role in God’s drama. Ironically religious Christianity is often the purveyor of the very beliefs and fears that get in the way of the water. Beliefs are an important part of any religion. What we believe matters, but not for the reasons we may assume. 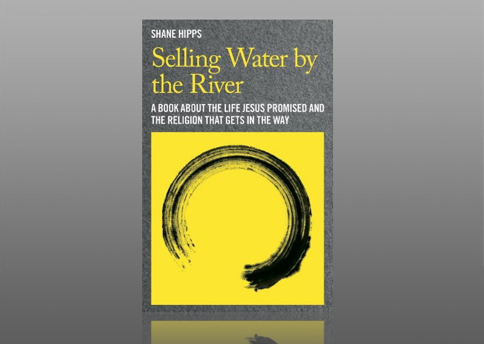 Our beliefs (or lack of beliefs) do not qualify or disqualify us from the river. Instead, they determine how clearly we will see the river, which is always running just beneath our noses. Some beliefs clear the way and give us high visibility, while others create a thick fog. The distance between the river and us never actually changes. What changes is how well we can see and accept it. I am convinced that many of the barriers to the water created by religious Christianity share a common source – the ways we have been told to understand and interpret the Bible. The Bible contains sixty-six books, in dozens of literary genres, written by nearly as many authors, in multiple languages, over several thousand years. The Bible is not merely a book, but an extensive library capable of conveying wide and brilliant truths. The Bible is like a piano with a vast range of notes and capable of playing an endless array of songs. In the last few centuries, Christian institutions have narrowed the range of notes it plays, resulting in a simple song easily learned and repeated. But through time, repetition, makes any song, no matter how beautiful, lose its edge and interest. The fresh becomes familiar and what was once powerful become predictable. Familiarity breeds predictability, and this leads to boredom. Today, we are in danger of believing that nothing new can come from the pages of this ancient book. But the notes that have been neglected are waiting to resound with songs that still surprise. Strings long silent are now eager to sing . . . [A]n effort [is needed] to let sound these neglected notes, to strike the dust from those strings and let a new song rise. A song big enough for a complex world. A song that wakes the weary from their boredom and sleep. I agree with Hipps here, and I believe this new song can and should be sounded. With regard to the church-world relationship and better engagement with society, however, I also think that we need to mine for songs to sound in culture and in life that corroborate the Bible — not just that stem from it. And I’m sure Hipps would only say the same thing. We need to look outside the Bible simply because the Bible is no longer as widely revered as it used to be. Unfortunate as this may be, it’s a reality with which Christians must do a better job dealing. There’s no “going back” on this front. As such, we have to ask, what are the “sacred texts” about “water” that God has given us to discover beyond the holy writ? Where and what are the sacred places and practices outside of our sanctuaries? Whether and how we answer these questions is likely to significantly influence the future of Christian churches in North America, for good or ill. Enter your email address to get every new post sent right to your inbox. 1 Corinthians 1:10-17: "Unity through the Gospel"
"There is no doubt abortion is tragic . I don't believe anyone ever ..."
"Wow!!! I love this guy! Peacemaking is so dear to my ..."
"Glad you appreciated it, Jennifer. Thanks for commenting. The encouragement is gratefully received! ..."
"Thank you for referencing Jesus as a Rabbi! I can't believe how ..."
"Hi Tina, thanks for your comment. Unfortunately the transcripts from TJ's sermon's are ..."